MY EMILY ROSE, soma 24.5 pontos pela ABQM e R$ 14.360,00 em ganhos pelo SGP. - 1°L. 4º Grand Prix e 1º Slot Race Ycambi Ranch 2014 Três Tambores - Aberta ? Junior. - 1°L. 4ª Etapa do 1º Campeonato NFQM - 2013/2014 Três Tambores - Aberta ? Junior. - 2°L. 1ª Copa Elite Estadual RJQM 2014 Três Tambores - Aberta ? Junior. - 2°L. 1ª Etapa do Campeonato NFQM - RJ Três Tambores - Aberta ? Junior. - 3°L. 1ª Festa Country do Centro Hipico - Sapucaia 2013 Três Tambores - Aberta ? Livre. including a 2-year-old of 2010 currently racing? 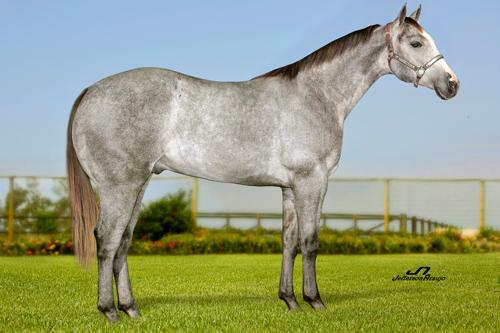 Stakes winner of 4 races to 4, $291,934.00, including Heritage Place Fut., 2nd QHBC Juvenile Classic, 3rd Golden State Fut, Remington Park D., Heritage Place D., Mothers Day Fut., Special Effort S.
by Twist Real Easy. Unplaced. Dam of 6 foals, 4 ROM, including?